We understand that choosing a commercial roofing contractor for your roofing needs is not always an easy task. However, if you are in the market for a reliable commercial roofing company in Lancaster, OH, then it’s not such a hard job. The professionals at E&E Construction can take care of all your roofing needs. We are a full-service commercial roofing company that specializes in friendly, reliable service. At E&E, we make it our job to put your mind at ease and your roof in shape. Call us today at (740) 331-0695 for your free estimate. At E&E Construction, we are not just about the services we offer, but we are in the business of serving. We focus on providing you with first-rate commercial roofing services and friendly, dependable workmanship. Our team of highly trained and skilled roofing technicians specialize in commercial roofing and are familiar with every type of roof. We provide the finest commercial roofing services in Ohio, and it all starts with Conklin Roofing System’s premium roofing products. We chose Conklin because they have 35+ years of steadfast performance reputation in the industry. 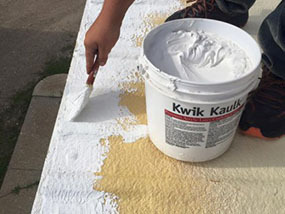 With Conklin products in place, our roofs provide numerous benefits in terms of longevity, energy-efficiency, and competitive pricing. 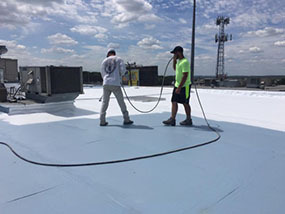 Top-rated services – We don’t just offer your typical roofing repairs, but we have partnered with nationally acclaimed product manufacturers to provide work that meets the highest standards of excellence. Quality workmanship – Every job begins and ends with a multi-point inspection to ensure that your roof repair, restoration, ore replacement is operating at 100%. Dedicated attention – From the office to our on-location job sites, we strive to keep you in the loop every step of the way. Excellent customer service – Our employees are trained to treat every potential and current client with the utmost respect and courtesy. We are available 24/7 for emergencies, as well. As a commercial roofing contractor in Lancaster, OH, the satisfaction of our clients is our top priority. We have structured our business accordingly. Every service is designed to gain your complete satisfaction and guarantee the safety and performance of your facility. When you choose E&E Construction for all your commercial roofing needs, you will not be disappointed. At E&E Construction, day after day and year after year, we continue to deliver the quality our clients expect. If you have any questions, we would be happy to answer them. Call us now at (740) 331-0695. Hire us as your commercial roofing contractor today and get your roofing issues resolved.